The Monkees are returning to the road in July for a 24-date American tour they are dubbing "A Midsummer's Night With the Monkees." As was the case on their reunion tour in late 2012, it will feature surviving members Michael Nesmith, Micky Dolenz and Peter Tork. "The reaction to the last tour was euphoric," Micky Dolenz tells Rolling Stone. "It was pretty apparent there was a demand for another one." The show will present the Monkees' songs in chronological order, utilizing archival video and photographs to tell their story. The evening begins with early hits like "Last Train to Clarksville" and "I'm a Believer" before focusing on their 1967 LP Headquarters and then wrapping up with material from their final albums, such as "Pleasant Valley Sunday" and "Listen to the Band." 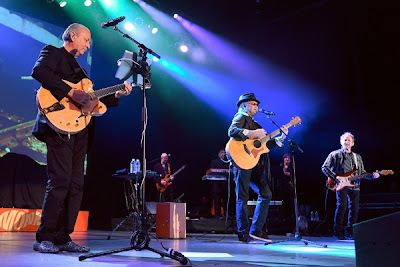 Last year's Monkees tour marked the group's first American concerts with Michael Nesmith since he left the group in 1970. (He did reunite with the group for a brief U.K. tour in 1997.) "We always kept his songs in the setlist," says Dolenz. "But when he sings the leads it brings a whole different feel and dynamic to the band . . . The two of us had such a nice blend on those early records. It was two-part harmonies like the Everly Brothers." Michael Nesmith's mother invented Liquid Paper and left him a considerable fortune when she passed away. He mostly stayed clear from the music world during the past few decades, but around 2011 he began playing small solo gigs. "I saw him with the Watkins Family at Largo a couple of years ago," says Nesmith. "This is before the Monkees reunited in 2011, and before David [Jones] passed. Mike said to me, 'I just started listening to my own songs. I realized that stuff wasn't half bad. Then I just started picking up my guitar and playing a bit. It sounded pretty good.'" Monkees fans erupted with euphoria when he returned to the stage last year. "That went a long way towards convincing him that people do want to see him again and hear his songs," says Dolenz. "It's almost like, 'How can you not do it?'" Davy Jones passed away in February of 2012, and the group's tour later that year paid tribute to him many times throughout the night. "This time we probably won't lean so heavily on the David situation," says Dolenz. "I think we have to move on. Everybody has to move on. He'll always be remembered and acknowledged, but possibly not as much as on that particular tour. We will, of course, still perform 'Daydream Believer' and all the other hits." There are no firm plans beyond these summer dates in America, but Dolenz expects the tour to keep going. "I can be frank and tell you we are thinking about taking it everywhere," he says. "There's always been interest in Japan, Eurasia and Australia and New Zealand. There's a huge fan base in South America and Brazil in specific, which we've never really tapped into. There's also talk about Europe and the U.K."
The Monkees haven't recorded a new album since 1996's JustUs. "I'd love to make a new one," says Dolenz. "We haven't had any discussions about that beyond, 'Wouldn't it be cool to have a new one?' We're just taking this whole thing one step at a time." 7/21 Warner Theatre, Washington, D.C.